The tilak-chandlo and kanthi are unique to the Swaminarayan religion. They symbolise the Vishishtadvait philosophy of Lord Swaminarayan. The tilak represents the Lord and the chandlo represents the muktas that reside within Him. On the auspicious day of Kartik Sud 11, Vikram Samvat 1858, (16th November 1801), Shree Ramanand Swami appointed Lord Shree Swaminarayan as the successor of the religion that he had established. Shree Ramanand Swami narrated the story of how he had established the religion. "I used to profess the philosophy that the Lord is saakaar (the divine form of God has a form. God is not formless, but has a definite identifiable form - human-like, even in His divine abode). Ramanujacharya (a leading philosopher, 11th Century AD) had previously professed this idea. Because of these beliefs, I was tormented and harassed by many, but I never faulted from by beliefs or my devotion. My travels brought me to Shreerang Kshetra where Shree Ramanujacharya gave me darshan in a dream. He initiated me as a sant and commanded me to establish this religion, keeping a prominence in devotion and submission. When I awoke, I discovered the tilak mark on my forehead and a kanthi around my neck." 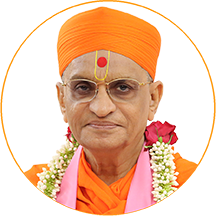 On the 14th day after Shree Ramanand Swami's departure to Akshardham, the supreme Lord Swaminarayan called a vast assembly of all the religion's sants and devotees. It was during this sabha, that Lord Swaminarayan first revealed His eternal and supreme name Swaminarayan. At this sabha, Lord Swaminarayan also commanded everyone to impress the same sort of upright tilak made of sandalwood on their foreheads with a round chandlo of kum kum or sandalwood in the middle of it. He ordered women to impress only a round chandlo, and widows not to impress any mark. This is the background to how the tilak-chandlo and kanthi came to become the principle symbols of the Swaminarayan Sampradaya. The mark of the tilak-chandlo distinguishes a follower of Lord Swaminarayan from all others. The sight of it will prompt others to utter the name Swaminarayan, or for those who do not know, to urge them to enquire about its significance and thereby, they too will become introduced to Lord Swaminarayan, through His devotees, as a result of this mark. The tilak is made of sandalwood paste. This has a cool, soothing effect and the fragrance helps to maintain a pure and clear mind. The chandlo is made of red kum kum (potash nitrate). The kanthi is a double stranded necklace made of wooden beads, usually the tulsi plant. Tulsi is believed to be sacred, and valued and blessed by God. When someone places a kanthi around their neck, they take the vows of the religion and swear by their own necks to abide by them. The tilak-chandlo and kanthi are unique to the Swaminarayan religion. They symbolise the Vishishtadvait philosophy of Lord Swaminarayan. The tilak represents the Lord and the chandlo represents the muktas that reside within Him. Once the Muktas enter the murti, they will eternally remain there. There is a union between them, i.e. they appear as one, but there is a distinction, the master and the devotee. When the two merge, they appear as one - the master (just like the tilakchandlo is one symbol, and the kanthi is one necklace), but in reality they remain distinct in their nature and their attributes, with God remaining the master and the soul forever remaining the servant. Similarly, the kanthi appears as one unit but in reality it is composed of two identical strands. This is the Vishishtadvait philosophy. Lord Swaminarayan has commanded everyone to wear a double stranded kanthi and impress the tilakchandlo in the Shikshapatri.